ADA Compliant Round Picnic Tables - Picnic Table Store-Commercial grade quality-lowest price. View the biggest selection of ADA compliant picnic tables! The round ADA compliant picnic tables have an extended top for wheelchair access. Below you will find Thermoplastic, Plastisol, and Concrete picnic tables. 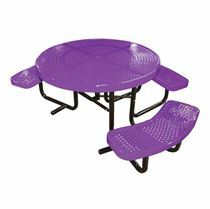 We offer the round ADA picnic tables with two or three seats depending on your seating needs. ADA Wheelchair Accessible Round Thermoplastic Picnic Table, Regal Style, 229 lbs. 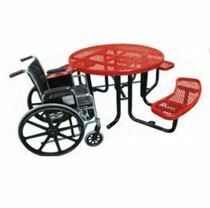 Round ADA Wheelchair Accessible Plastisol Picnic Table, 336 lbs. Round ADA Wheelchair Accessible Picnic Table with Fiberglass Top and Plastisol Seats, 376 lbs. ADA Wheelchair Accessible Round Thermoplastic Picnic Table, Regal Style, In-Ground Mount, 288 lbs. ADA Concrete Round Picnic Table Wheelchair Accessible with Bolted Concrete Frame, 860 lbs. ADA Wheelchair Accessible Round Thermoplastic Picnic Table, Regal Style, Surface Mount, 288 lbs. ADA Wheelchair Accessible Round Concrete Picnic Table with Metal Frame, 850 lbs. 46" ADA Wheelchair Accessible Round Expanded Metal Children's Picnic Table, Portable, 215 lbs. 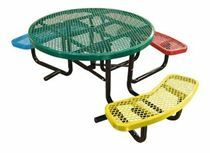 46" Round Expanded Metal ADA Picnic Table, Thermoplastic Steel, Wheelchair Accessible, 245 lbs. 46" Round Perforated ADA Picnic Table, Thermoplastic Steel, Wheelchair Accessible, 235 lbs. 46" ADA Compliant, Single Post Thermoplastic Perforated Metal Round Picnic Table, 3 Seats, Inground Mount, 230 lbs. Which mounting options are available? There are three methods of mounting your picnic table based on the frame style: Portable, In-Ground, and Surface Mount. The description and specifications of the product will indicate the mounting style. A portable frame is ideal if you do not have a place to permanently install the picnic table. Portable frame are a non-permanent solution, making it possible to move the picnic table. Portable frame can sit on a flat surface without anchoring. Surface mounting is a semi-permanent solution. If you would like to leave the possibility of moving your picnic table some day, however if vandalism is a concern than surface mounted frames are ideal. 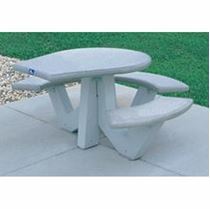 Surface mounting is great if your picnic table will be going onto a concrete surface. Surface mounting requires a steel plate to be bolted onto a concrete or asphalt surface. In-Ground mounting is a permanent solution for areas where vandalism is a concern. In-ground mounts are used in grassy areas or are prepared to be put in a concrete pad. The installment for an in-ground mount requires the post to be set into an approximately 18" concrete poured hole.